Special microscopes : extreme level of positioning freedom. FemtoSmart is the next-generation two-photon microscope series from our partner Femtonics. In the design, the main goal was to create a totally customizable microscope for in vivo studies with a distinct, charismatic appearance. 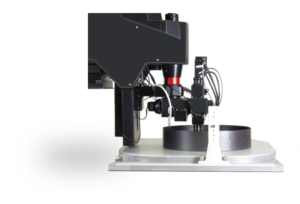 The special feature of this microscope is the elevated body, which allows extremely free positioning of the sample below the objective. 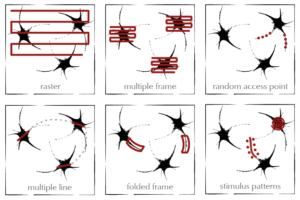 The large space under the objective, where you can place virtual reality, movable tables, electrophysiological devices, is extremely useful for behavioral studies and supports functional studies of model organisms from C. elegans to non-human primates. The column-based X-Y-Z moving body houses the scanner unit, control circuits, and internal light path. The footprint of the leg is only 250 mm x 250 mm and there is a large space below the objective. The design enables the objective to move in a 50 mm range in the Z direction and the microscope can move in an XY direction around the base in 50 mm range. The tilting objective can further increase mobility.